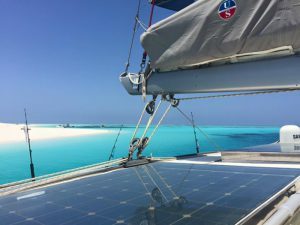 Zanzibar Overnight Yacht Cruise to The Mnemba Island Atoll. Book Now. 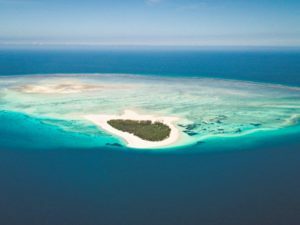 BOOK OUR ZANZIBAR OVERNIGHT YACHT CRUISE TO THE SPECTACULAR MNEMBA ISLAND! 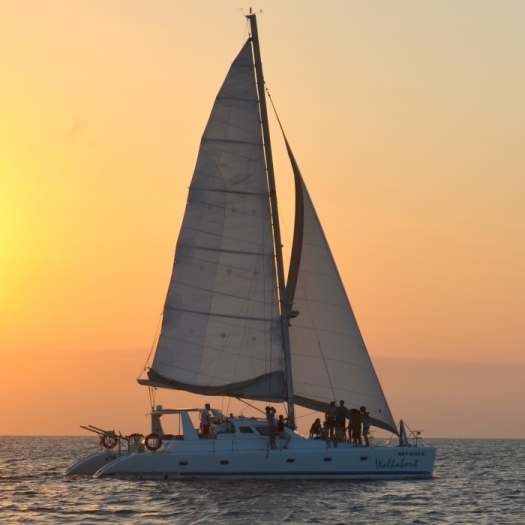 Spend the night aboard our Zanzibar Overnight Yacht Cruise. Enjoy your time onboard one of our beautiful Catamarans or Power Yachts. Sleep in your own private cabin, or sleep on deck under a sky of diamonds onboard our spectacular Zanzibar Overnight Yacht Cruise to the Mnemba Island Atoll! Enjoy Stunning Tropical Island Waters! Be prepared! The stunning beauty of this Indian Ocean Island Atoll will take your breath away! Crystal clear waters, shades of turquoise and blue, calm lagoon areas to anchor, freshly prepared seafood dinners, cold beers and wine, good tunes, fantastic snorkelling, beautiful diving, swimming and great fishing opportunities make a trip out to the Mnemba Island Atoll a must! – Return feeling refreshed, invigorated & relaxed! 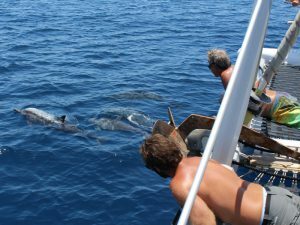 Enjoy Dolphins & Sea Life! – Maximum: 6 Guests accommodated in 3 double cabins. – All inclusive of all meals, snacks, hot/cold beverages, beer/wine, snorkelling gear, fishing equipment and Kayak (available on request). Guests are NOT ALLOWED onto Mnemba Island itself as it is a Private Lodge. 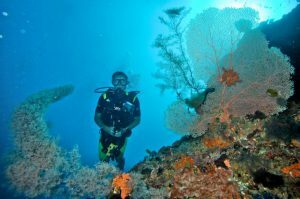 We visit the reefs, drop offs, lagoons, snorkelling areas, SCUBA diving and fishing spots that surround this beautiful Atoll. Our Zanzibar Overnight Yacht Cruise to the Mnemba Atoll departs from the beach here in Nungwi on the northern tip of Zanzibar Island. We depart from the beach here in Nungwi at 11h00am and we return to the beach at 11h00am the following morning. Contact us and we will book your Hotel Transfers to and from our base in Nungwi for you. Our Hotel Transfer Service Provider will pick you up at your hotel reception and return you to your hotel after your Overnight Yacht Cruise. Call, WhatsApp or email us now and we will get back to you with pricing and pick up times from your hotel reception. Book your own Private Double Cabin onboard our all inclusive "Shared Live Aboard Yacht Charter" to Pemba Island NOW! 2 Cabins currently available. Charter departs from Nungwi Beach 18th or 19th June 2019. Drop us an email or call or WhatsApp us on +255 (0)777 430006 to BOOK YOUR CABIN NOW! Nungwi Bay Luxury Sunset Cruise! Book your spot onboard our Nungwi Bay Luxury Yacht Sunset Cruise NOW! Only $100/person includes beers, wine, soda's, mineral water and freshly prepared prawns, calamari and catch of the day seafood snacks! Departs from Nungwi Beach with a minimum of 5 guests from in front of The Z Hotel at 15h30. Tickets available at our Office, Gerry's Bar or call or WhatsApp us on +255 (0)777 430006 to BOOK YOUR SPOT NOW! Gerry's Bar – Nungwi Beach Zanzibar! Cold Cocktails, Beers & Awesome Sunset Vibes! There’s something magical about Gerry's Bar. With a cocktail in your hand and your toes in the sand, enjoy good vibes, great food and spectacular Sunsets! Featuring guest DJ's and Live Music! Located on Nungwi Beach, Zanzibar! Karibuni Sana!